Semi secluded cottage nestled in the mist of Fort Morgan Peninsula wildlife. The Cottage is ideal for 2 couples or a small family get-way. Enjoy the covered decks to watch wildlife and the famous Blue Angles practice. 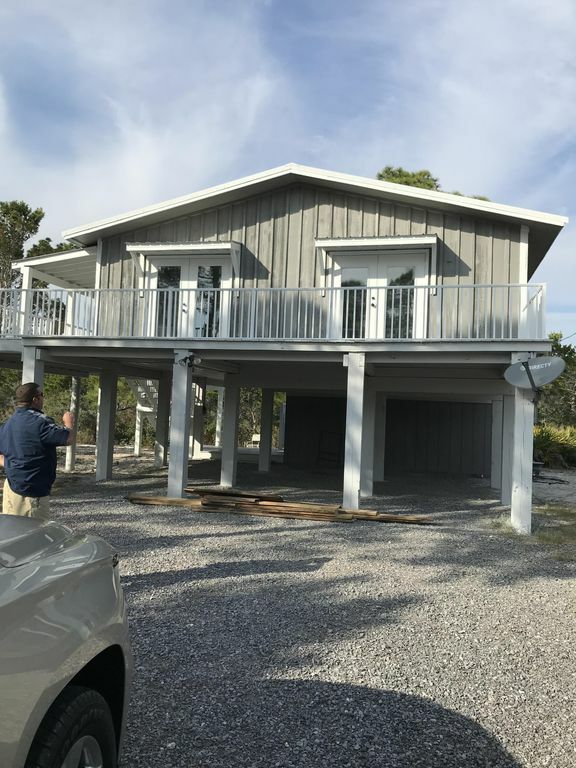 The location is perfect for boaters to launch at the Mobile Bay public launch, short 2 miles away or drive to the west 4 miles to the Fort Morgan public launch. This is a quick route to the Gulf of Mexico. There is plenty of parking at the house for your boat. Bring your kayak or rent one for extra outside activities. Safe bike riding in the area. The Surfside Subdivision has owner beach access at the south end of Surfside Drive. We have a wagon for you to transport beach needs in the downstairs storage area. Outside enclosed shower with hot and cold water. Fish cleaning sink outside for cleaning your catch. There is a fish cooker in the downstairs storage. Several local restaurant and golf course within 3 miles. Visit the near by convenient stores for reasonably priced items and supplies. One even has fresh meat and produce. No need to make that ride to Gulf Shores. Cottage has 2 TVs with cable ,WiFi and DVD player. Fun and rest to be had by all. My husband moved this little house to this location in 2015. It has been a rehab in progress every since. He did the kitchen and I did the bathroom. Fun and sweat until he go sick in September of 2016 and never got to see it as it is now. He passed away in January 2017 but his memory and honor is everywhere in this precious piece of paradise on the Fort Morgan Peninsula. House is located so central to fishing in the gulf and bay. Kayaking bring your own or rent. Golf course 2 miles away. Plus the courses in Gulf Shores and Trent Jones at the Grand Hotel. History at Fort Morgan and a ferry ride to Dauphin Island. Maps and brochure are in the cottage. Great property for our spring break family vacation. The gulf cart made trips to the beach easy and fast. We like being near the beach while away from the more tourist-driven Gulf shores area. We would love to visit again next year. Was perfect space for our family of 4! Loved the owner offering the golf cart for a small fee as the beach was a little further away than I thought. We would definitely recommend this spot!! Loved it. Exactly as described. The house was great, clean, and comfortable. The owners are amazing to work with and respond very quickly. I would absolutely come here again! We absolutely loved our stay at Palmetto Paradise and wouldn't hesitate in a second to come back and do it again. Lee was more than responsive and took care of our every need when we had a question. Not only did we love the cottage but he also offered a golf cart for our use (at a very nominal fee I might add) which made getting from the cottage to the beach and back a breeze (and fun!). The beach was just perfect and never too crowded. Highly recommended! Another great VRBO experience! We had a lovely time at the Palmetto Paradise! If you are looking to get away to a secluded area, this is the place. It’s 3 blocks from the beach but, an easy walk to and from. We are an active family so it wasn’t an issue. The outside shower was so nice and convenient for our little family to wash off after a long wonderful day at the beach. Surfside Shore beach was incredible. There was plenty of room for relaxation. Not crowded at all. We couldn’t have asked for a better experience at the Palmetto.